As real estate development is guided and regulated through a growing labyrinth of local, state, and federal laws, having an experienced team of attorneys at your side can keep a project on point with legal requirements and on schedule. Goosmann Rose Colvard & Cramer, P.A. recognizes that development delays and issues that cause progress stoppages ultimately affect the bottom line. Contact us today to begin working with our skilled property development lawyers. Because real estate development law is always evolving, you want the dedicated and up-to-date team of attorneys with Goosmann Rose Colvard & Cramer, P.A. to assist with your next development project. Our team handles every part of the acquisition or sale of commercial and/or residential development real estate, including for mixed-use projects; office buildings; shopping centers; hotels and resorts; condominium or townhome developments; and single family residential projects. We take the time to understand the specific needs of our client, whether you are the buyer or the seller in the transaction. Every construction and/or development project is guided by contracts and management agreements and the team with Goosmann Rose Colvard & Cramer, P.A. has extensive experience managing all legal aspects of a project. We routinely review and draft contracts, review and coordinate financing requirements, and more. As this vehicle for real estate development grows, our attorneys will continue to assist with all facets of joint ventures and/or other development entities and organizations. We have a thorough understanding of the local, state, and federal tax laws that affect these entities and provide guidance and work closely with your accountants and/or in-house counsel, as applicable, to mitigate risk to the parties involved. Our law firm has a long history assisting industrial, office, and retail landlords and tenants in matters of commercial real estate development. From drafting an initial lease agreement to reviewing a proposed renewal, we make sure our client’s best interest is put and kept at the forefront. The state of North Carolina requires an attorney to handle due diligence duties related to the property title, including the title opinion following an extensive analysis. Our attorneys are well-versed in a breadth of commercial titles and have overseen small and large commercial and residential real estate transactions. The team with Goosmann Rose Colvard & Cramer, P.A. takes a leadership role in many urban development projects. 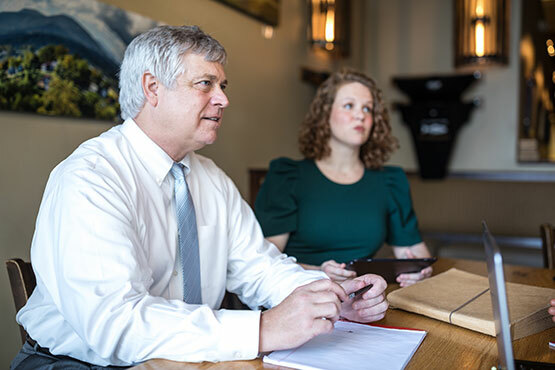 Whether providing guidance for concept proposals or finding a solution for related but complex financing issues, our Asheville real estate attorneys look to apply a strategic direction throughout the duration of the project. Any type of property development involves numerous interested parties and players and their varying roles, desires, and needs. Having an attorney who can help coordinate among and keep clear requirements of the various parties while finding appropriate and time- and cost-effective options and solutions to any legal hurdles that may arise is crucial. A real estate development attorney explores solutions, addresses concerns and builds and maintains relationships throughout the development process. How Can A Commercial And/Or Residential Property Development Lawyer Help Me? Drafting documents for and coordinating with necessary parties for any private or public easements or agreements needed for utilities or infrastructure requirements for the development. A lawyer with Goosmann Rose Colvard & Cramer, P.A. is able to scale their efforts to reflect the needs of your commercial and/or residential development. With a holistic but proactive approach, all phases of the project will be optimized throughout each lifecycle. Contact our law firm today.